GMO Corn: Little Nutrition But Lots of Toxins! Thursday, May 30, 2013 - A recently released 2012 study, called the Corn Comparison Report, detailed the nutritional deficiencies of GMO corn compared to organic corn. The report reveals the stunning levels of glyphosate in GMO corn and the astounding lack of some minerals. Organic corn has 14 ppm of manganese. GMO corn has only 2 ppm. Real corn has 7 times more manganese! 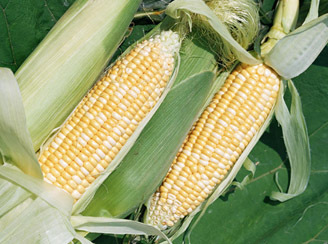 Organic corn has 6130 ppm of calcium. GMO corn is stripped down to 14 ppm. Real corn has 437 times more calcium! Organic corn has 113 ppm of magnesium. GMO corn is vacant, with only 2 ppm. Real corn has 56 times more magnesium! GMO corn also contains alarming glyphosate levels. American EPA standards allow glyphosate in water of up to .7ppm. European tests indicate that animals begin experiencing liver damage at .0001 ppm of glyphosate in water. Thus, America’s water levels contain glyphosate that is 7,000 times greater than the amount required for animal liver damage! GMO corn contains 13 ppm of glyphosate, or the equivalent of 130,000 times more toxicity than EPA water standards! Given a choice, animals reject GMO corn. Dr. Huber also found out that .97 ppm of formaldehyde is toxic to animals. The GMO corn he tried to give the animals contained 200 times that amount! Monsanto Protection Act, biotech giants have just been absolved from any liability resulting from the use of their toxins. This leaves justice, freedom, and the future of health in the people’s hands. If you are feeding any GMO corn, do not expect computer balanced rations to meet the mineral needs of your animal. Give them a choice by providing access to ABC’s cafeteria style mineral program, available for Beef, Dairy, Sheep, Goats, or Horses. Advanced Biological Concepts also has special products that alleviate many of the adverse effects of feeding GMOs. (NaturalNews) As Monsanto parades their genetically modified seed, throwing it out like candy into the fields, future generations are being subjected to nutritionally void, disease-causing food. As the government protects the GMO industry, with its recent signing of the "Monsanto Protection Act", the republic’s health interests are being discarded. Organic corn has 6130 ppm of calcium. GMO is stripped down to 14 ppm. The amount of formaldehyde and glyphosate in GMO corn is unbelievable. To break it down, American EPA standards allow glyphosate in water of up to .7ppm. European tests indicate that animals begin experiencing liver damage at .0001 ppm of glyphosate in water. Putting these two statistics together, America’s water levels contain glyphosate that is 7,000 times greater than the amount required for animal liver damage!